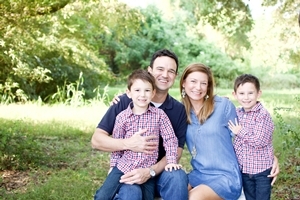 Keri Daigle Hebert, owner of The Learning Train, has been an educator for seventeen years. She has a bachelor’s degree in elementary education from the University of Louisiana at Lafayette, a master’s degree as a reading specialist from Louisiana State University, a library science certification from Louisiana State University, and became National Board Certified in 2009 in English Language Arts Early Adolescence. The mission of The Learning Train is to promote the physical, emotional, educational, and social development of children. Parental involvement is important to our activities because when parents enter their child's world of play and imagination, the child blossoms with more confidence to explore and learn. Time spent playing with mom or dad contributes to healthy emotional development and will also build trust between parent and child. Matt and I have been married for seventeen years. In 2010, our son Adam was born. In 2011, our second son Max was born making us a family of four. Our children are the most special blessings to us and our lives have been greatly enhanced since their arrival.